People still talk about the first plane crash top of the 1960s when a pilot crashed at Waterworks, and PanAm crash in 1965, followed much later by one of the Payne brothers and later, Len Kocen who owned the Shamrock cinema. 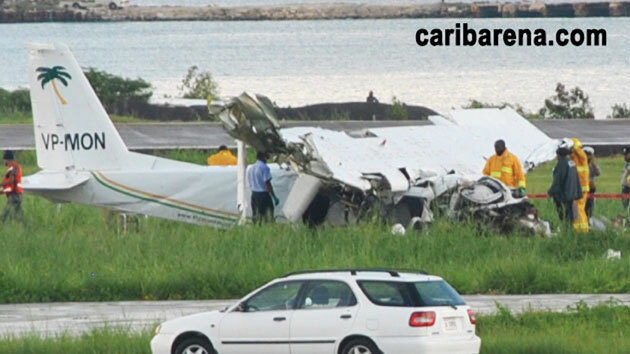 All that was in the long past until Sunday, October 7, 2012 shortly after 4.00 p.m. the news and reports out of Antigua inform that the pilot and a female passenger had died on a FlyMontserrat aircraft that crashed. Another female passenger after being reported as critically injured later died, with one male survivor, who since suffering from a broken leg, had soon returned to the UK. 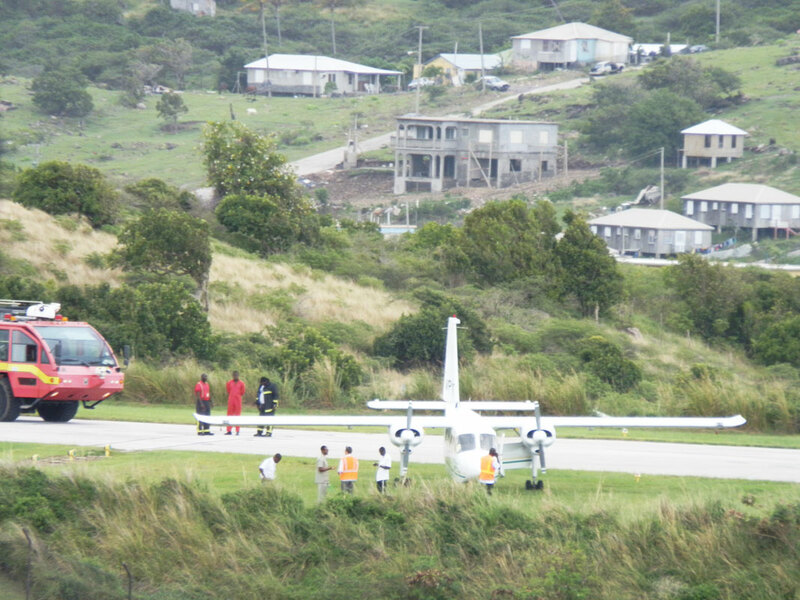 The nine-seater plane crashed shortly after takeoff at VC Bird International Airport in Antigua around 4:16 p.m. The VC Bird International was initially closed to the public, while residents were being urged to stay away from the area so that emergency personnel could carry out their work, but the airport reopened not long after. Fly Montserrat is owned by Montserrat Airways Ltd and its Managing Director issued a report the following day confirming the crash and giving the name only of the pilot Jason Forbes, stating that two of the three passengers had died. “Our thoughts and condolences are with the families and friends of those on board,” the release had stated. 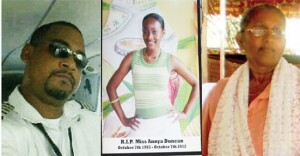 With much sadness and as residents and friends who were expecting their loved ones gathered at the John Osborne airport, the names of those who had died were soon circulated with photos of a Jamaican MSS school teacher Anya Duncan and the pilot. On October 12, a preliminary report was issued on the crash (see: http://www.themontserratreporter.com/preliminary-report-on-flymontserrat-crash/) which stated: “Examination of the wreckage indicates that the number two (right-hand) engine was not producing power at the time of impact, and investigation of the fuel system feeding that engine found significant quantities of water. Annya Duncan’s friends were eagerly awaiting her arrival at John Osborne Airport in Montserrat to treat her to a surprise 29th birthday party – but the Jamaica-born teacher never made it. The dead woman’s family said she and fiancé of two years, Ricardo Mars, had planned to tie the knot next year. Annya according to her sister Sobrina said her younger sibling had been experiencing serious headaches in recent weeks and decided to visit a doctor in Antigua over the weekend. “The last thing she told me was that she was checking in and would let me know when she reached Montserrat,” cried Sobrina. Annya was pinned inside the aircraft when it crashed and died on the scene. Sandrama Poligadu, 57, got on a plane for the first time ever Sunday morning from her native Guyana to Antigua – before boarding flight 107 from Antigua to Montserrat to meet her daughter who is hospitalised with a complicated pregnancy. But she too never made it. She was anxiously headed to the emerald isle to meet her daughter Rajama Poligadu, her daughter’s partner Tristan Khan and their five-year-old daughter. British visitor Michael Hudson, the lone survivor of the crash, remained in critical condition at Mount St John Medical Centre at press time. As a mark of respect and in mourning, the Montserrat Secondary school (MSS) closed at 10 a.m. Monday to resume on schedule Tuesday. That evening teachers and students at the School, where Duncan taught integrated science and mathematics, held a candlelight vigil beginning at 6.00 p.m. at the institution. On the day before in the evening a well vigil was held at the Basketball courts at Brades. On Monday morning the Minister of Education Colin Riley and education officials along with members of the Christian Council, including Father George Agger and Pastor Carl Hastings, spent the morning with teachers and students at the school, many visibly shaken and emotional over the tragedy. “She helped everyone; loved animals, plants and people. Her students in Montserrat adored her and when her contract expired earlier this year she accepted the offer to renew it even though we tried hard to persuade her to stay in Jamaica. She said she had to see the class through to CXCs next year,” Sobrina had said, confirmed by students and teachers at MSS alike. The parents Coswell and Grace Duncan were “very hurt” and wanted people to remember Annya for her “selflessness.” They visited Antigua and Montserrat and have expressed the wish to have the full details of the crash investigated. Forbes, who was piloting the plane when it crashed, was pinned in front of Annya. He died on the spot. His death came a few hours after he and relatives ate and cheered together as they watched West Indies walk away with the Twenty/20 championships on Sunday. last 28 days – 25 hours. Roughly, each segment of a flight ANU-MNI would be approximately 20 minutes (flying time). 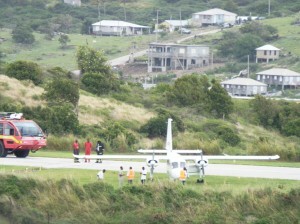 Shortly after this incident where the airline reported: “Flight 5M 2109 from Antigua with seven passengers, landed normally and decelerated along the runway…The pilot thought that he felt a minor vibration and as a precaution, he let the aircraft roll gently onto the grass, where the passengers disembarked,” a letter was sent to FlyMontserrat (Montserrat Airways Ltd.) to cease operations. The letter from the ECCAA stated: “Your company’s recent safety record particularly the two previous incidents and one accident coupled with the accident which occurred on 7th October 2012 and today’s incident are cause for concern by the ECCAA. That effectively grounded FlyMontserrat’s aircrafts and Harris by Wednesday evening sent in this statement. “FlyMontserrat understands that its passengers are concerned and stresses that safety is its priority and is co-operating with the investigation teams to help find the cause of last week’s accident. Meanwhile information provided from access sources, arrangements are in place for SVG Air, the other Islander operators out of Montserrat, to meet the requirements to passengers who already had bookings with FlyMontserrat.